Here is something of a cult classic. Originally a vinyl LP, this recording is finally available on CD. 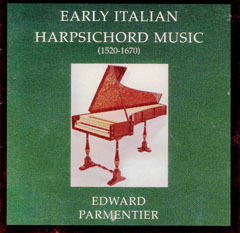 It was one of Ed Parmentier’s earliest recordings and is highly regarded among harpsichordists even some 26 years after it’s first release. We strove to retain the original high standard of sound quality to highlight these outstanding performances. Edward Parmentier, Harpsichord (Jerome Prager, based on a 1697 Sicilian harpsichord by Carlo Grimaldi).